*Rug was sent compliments of Lorena Canals. All opinions expressed are my own. If you have followed along with our home renovation journey, you have had the opportunity to see some of our designs and projects come to life. What you might not know, is that some of the most exciting of these projects (to me at least) are the ones that have been created more behind the scenes than in front of them. This can definitely be said of our almost two year old's bedroom. When we bought our home last October it had wall to wall beige carpet that we quickly tore out before refinishing the hardwoods. Up until this point, the floor in our youngest's room has remained bare and she has not had a soft place to read and play while in there, which was a problem I have been very eager to remedy. As I began designing Evelyn's new space, and preparing her to transition out of her crib, the vision for her room was a simple one. It needed to be a room that could be built upon as she grows with little additions here and there. After all, the budget for this project while not defined, would be a small one. I thought it best to start from the bottom up with what would likely the most expensive item that we were adding to the room. 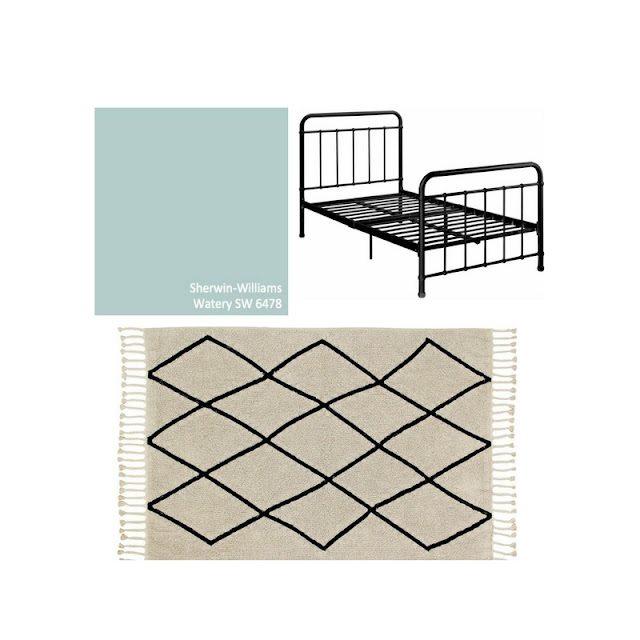 When deciding on the flooring for a toddler's room, three things came to mind while scrolling through pages and pages of rugs. It needed to be durable, easy to clean and affordable while fitting into our general home design and my goals for the space. To my surprise I was able to check off each of these when finding the brand Lorena Canals. Lorena Canals creates sophisticated handmade cushions and rugs that are machine washable and dryable, and perfect for any space from living room to kids bedrooms. As an eco conscious person I was even more excited to learn that Lorena Canals rugs are eco-friendly and made from 100% natural cotton that is naturally dyed and contains no VOCs unlike most carpets and rugs. The modern and simplistic Bereber Beige rug was the perfect addition to the space and would be that cozy spot that we could sit to play and read together or a space she could enjoy during her quiet time alone. The straight lines and neutral colors meant any theme could work for the future of this space. We are keeping the existing wall color as it is the perfect calming shade of blue that will set this room apart from other spaces in the home. The next steps are removing the crib and replacing it with a new mattress that will be placed on the floor for now. I will be keeping fingers crossed that the transition out of her crib goes well (that will be a whole new post!). The plan is to then purchase the same simple black metal bed frame two of her older sisters have in their shared room. While still in the very beginning stages, I look forward to sharing the progress we make in the coming weeks and the end transformation of this little space.